& a shabby faded painted frame. 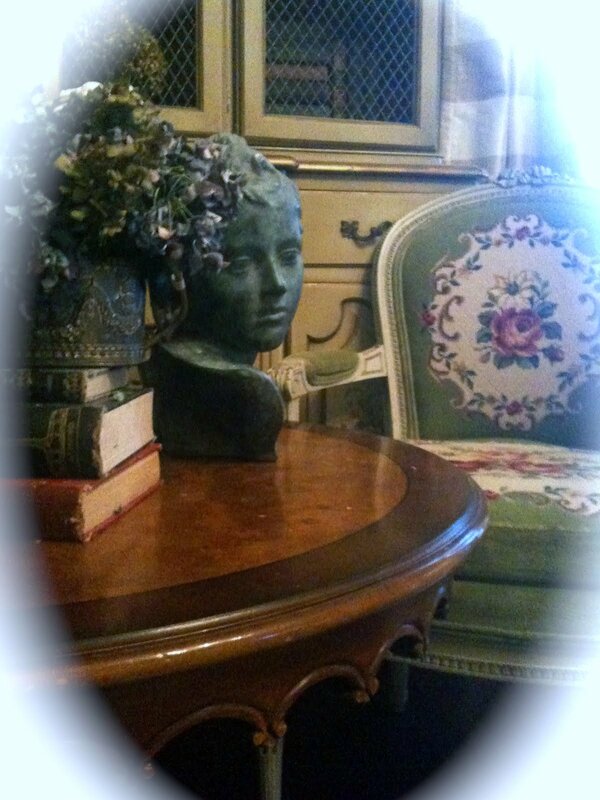 These antique chairs are definitely my favorite chairs. oh my goodness how I love these chairs! 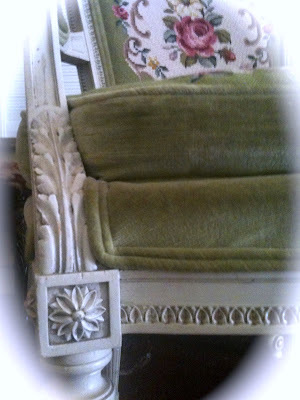 The shabby old painted carved frames & petite size. mixed with the roses and needlepoint on the seat and back. They are absolutely gorgeous in person. I was so in l.o.v.e. with them with I found them. the colors and style were perfect for me and the palettes I usually decorate in. 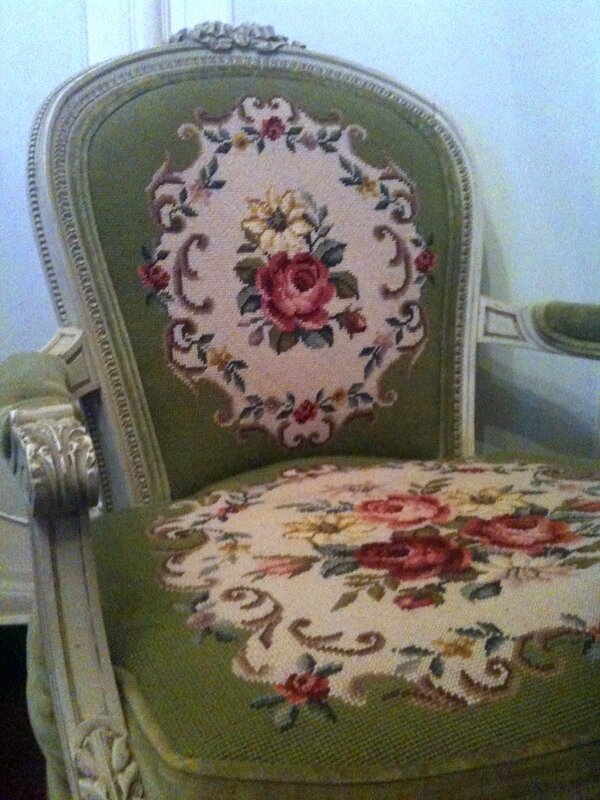 these chairs would fit somewhere in my romantic french room. 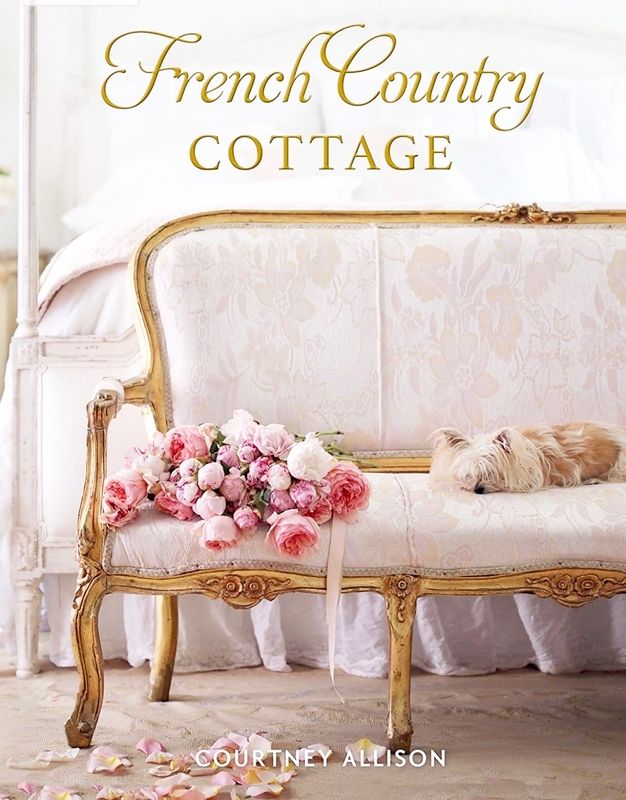 They are french cottage perfection! I adore the carved scalloped edging and rich color on this little table. Old books just look so good no matter where you place them. and stack them in cupboards, on shelves or on tables. A silver container filled with dried hydrangeas & a wee little dog... & this gorgeous bust. I found it sitting on it's side at the flea market amongst many random things. You almost didn't see anything except a kind of scary head laying there in the grass. Her details and color are just gorgeous. mr. linky will be up starting Thursday evening and is open through Sunday. So now ... after reading your post, I too am in LOVE with your chairs. Yes Courtney, they are to-die-for!!!!! 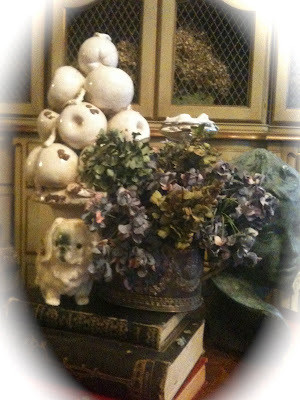 That entire vignette, in the last photo of your post, is STUNNING! It's all put together with perfection and shouts out loud "FRENCH CHIC"! Hope you're having a good day! Obviously I'm not being too productive here at work b/c I'm perusing blogs (tee hee). yes Courtney,those chairs are a treasure! !I love the colors of the background~so perfect! 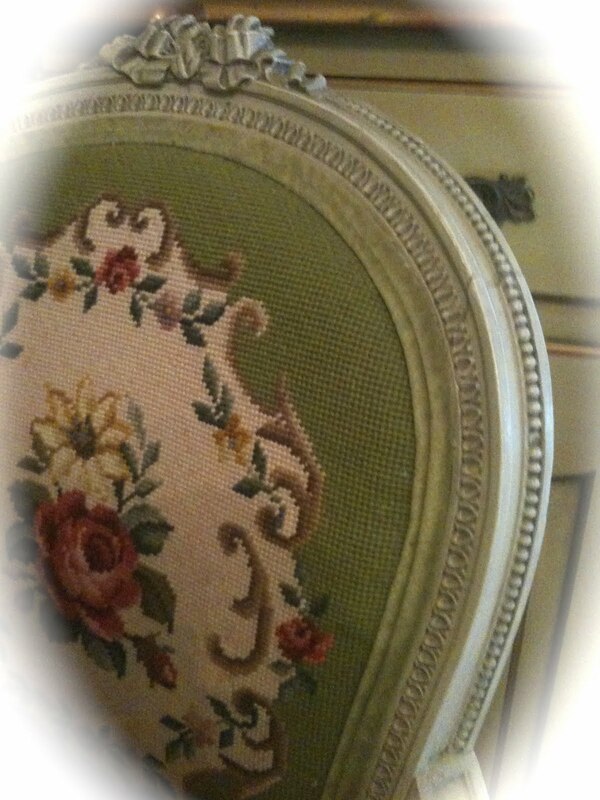 I have a pair of small needlepoint chairs on a yellowy gold background. They have a dark finish, but seeing yours I think I will paint them off white and invite them to my living room!! Courtney I adore your gorgeous green chair. Your blog looks beautiful too. Great design! Those chairs are gorgeous Courtney! 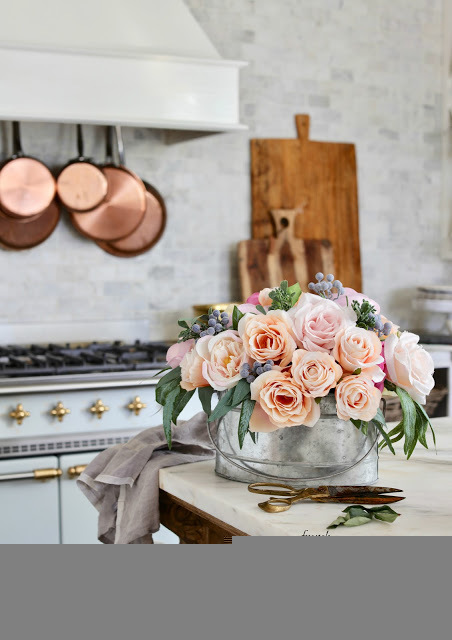 You really do know how to pull it all together and your home always looks so warm and like something straight out of "Country French" magazine! P.S. Your blog is looking so awesome! Hi Courtney, I also love your chairs and the cabinet behind them. 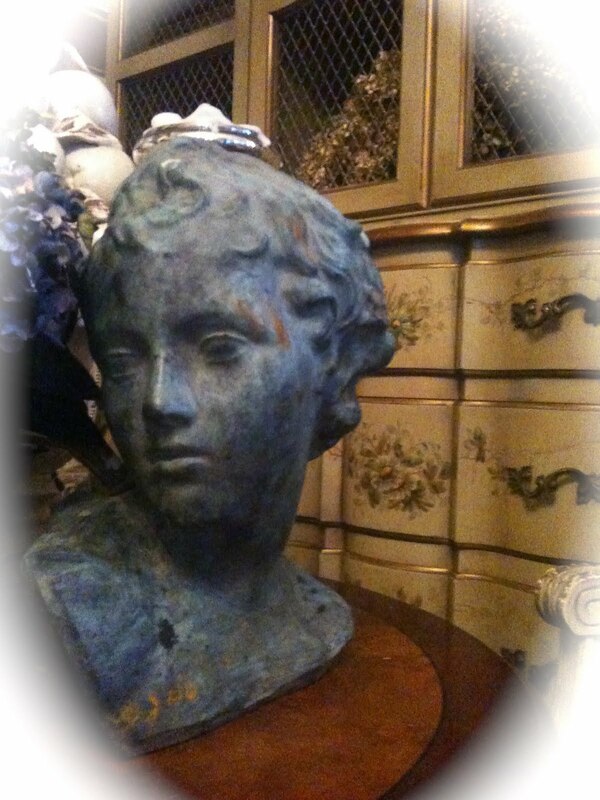 The bust is wonderful as is the entire vignette. Oh those chairs---They would fit perfectly in my home if you ever tire of them!!! 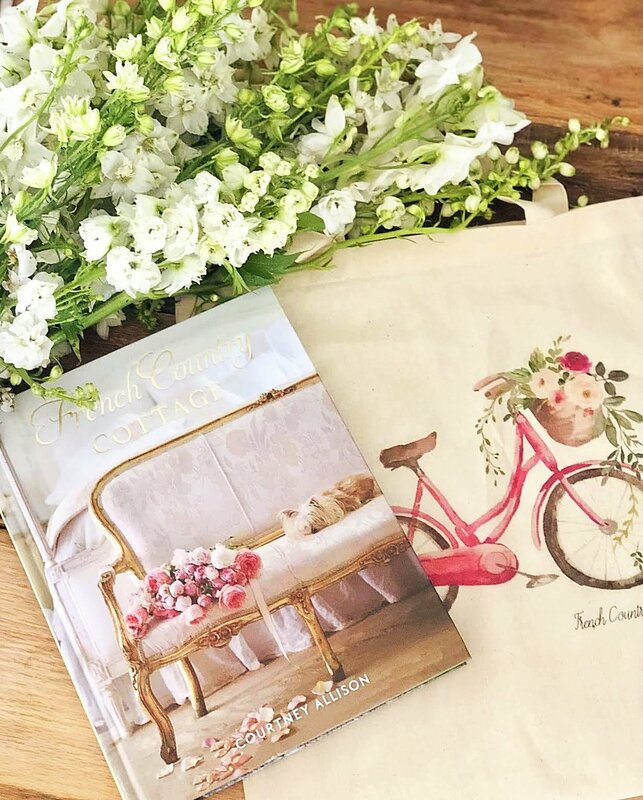 You really do have a french country cottage! 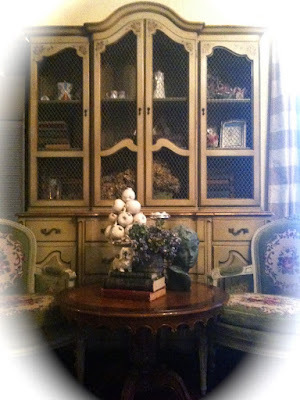 It's beautiful, the french hutch is lovely too! I can see why you fell in love, they are beautiful ! These chairs are just lovely. 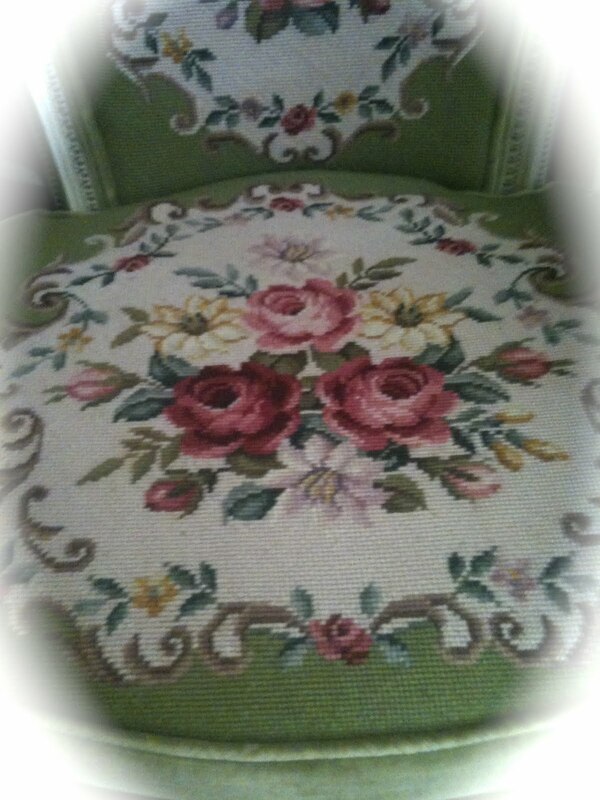 I love the colors in the needlepoint. They certainly fit in and I love the white wood too. How fun for you!! Have a great day. The chairs are beautiful, Courtney! I can see why you are in love with the, I love the needlepoint! Well I can certainly see why those chairs are your favorite. 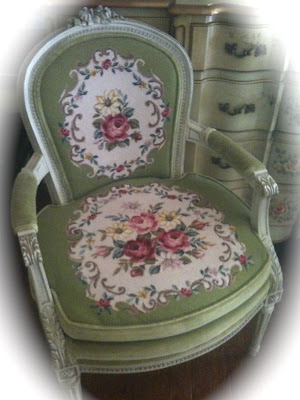 They are a perfect combination of beautiful floral with the excellent green fabric color and the white painted wood. 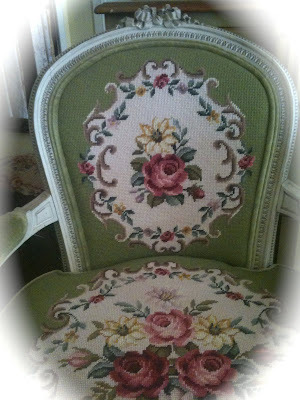 Add all that wonderful texture of both the needlepoint and the carved wood and you have stunning chairs. Can you tell how much I like them too? But wait, I also love that hutch of yours too! It's all so beautiful! What is not to love about everything you have shown here! Those chairs are wonderful. 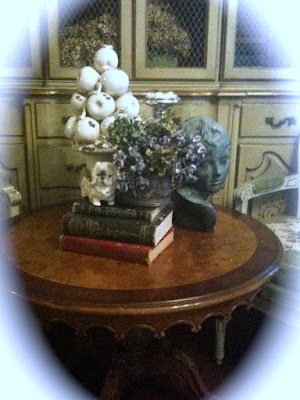 I love old books too, and your hydrangeas look so rich in their fall shades. Beautiful things! Thanks for stopping by! OOOO Courtney, those chairs are beautiful! What a find! I'm like you, I love all the adorable details! Thanks for sharing them with us! I'm in love with your chairs!!! Gorgeous!!! They are indeed---beautiful chairs!! Love everything about them. The soft green color is gorgeous. Hi Courtney, these chairs are just totally amazing!! The needlepoint is just perfection. So glad you shared these with all of us. 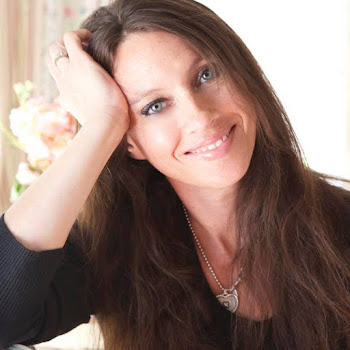 Thanks so much for linking up with VIF!